Cooperative leaders and micro-entrepreneurs gathering empathy at an innovation workshop in Kigali, Rwanda. “Design thinking is just a fad.” “We’ve been doing design thinking for the last 20 years–it’s just the same old process with fancy new words.” “People who use design thinking never follow through with their projects–it is a waste of time to generate ideas that never get implemented.” These are examples of a few of the kinder critiques of design thinking. Detractors are suspicious, antagonistic, and downright hostile about design thinking and the types of promises being made about its integration into business and education. In my own journey as an educator learning human-centered design thinking at the Florida Hospital Innovation Lab (FHIL) in Orlando under the tutelage of Dr. Karen Tilstra, I must admit the process seemed at best silly, and at worst absurd. I kept thinking, “What is the deal with all those sticky notes and whiteboards filled with insights?” But then I started seeing the results of design thinking firsthand. Teams of students came away from the innovation process empowered, and with an important tool to make social impact. FHIL helps Florida Hospital save lives and money, while social enterprises use design thinking to serve the poor around the world. In the last six years, I have been transformed from a doubter into an evangelist for human-centered design thinking. I integrate it into every class I teach, and I am always thinking about new ways it can be used. Instead of depressing students with the problems of the world, I now teach them to use their knowledge of problems to come up with desirable solutions. What is Human-Centered Design Thinking? Human-centered design thinking (HCDT) is a helpful tool that guides interdisciplinary teams to create viable solutions to social and environmental problems. At its essence, human-centered design thinking is an innovation mindset and a problem-solving methodology used in the public, private, and nonprofit sectors. It is also increasingly taught in colleges and universities. HCDT focuses on the needs of the end user or beneficiary and can be used to tackle any problem. The fast pace of change and the complex problems of our world demand new ways of innovating solutions, and HCDT is a game changer for social enterprises. Makers Unite is an inspiring example of how HCDT is being used in the social enterprise space. Makers Unite, a Global Social Benefit Institute enterprise based in Amsterdam, works with Syrian and African refugees and integrates design thinking throughout its business. Refugees, called “newcomers,” are taught creative confidence and HCDT in a unique 6-week curriculum, and make products that are sold through e-commerce. Newcomers are then matched with appropriate employment or educational opportunities. The founder of Makers Unite, Thami Schweichler, is a trained designer; he is always asking the end users how his enterprise can be more helpful and he constantly strategizes how Makers Unite can be financially sustainable and better able to scale. Human-centered design thinking is transforming the lives of students at Santa Clara University, and specifically at Miller Center. Our Education and Action Research division trains and sends out interdisciplinary student teams to work alongside social enterprises in the developing world. A year ago, student teams used HCDT to assist a rural cooperative in Mumeya, Rwanda, in building a business plan for a crop storage facility, and to provide insight to Pollinate Energy, a clean energy social enterprise serving urban slums in India. Kelly Grunewald, Social Enterprise Intern, leading a design-thinking activity. 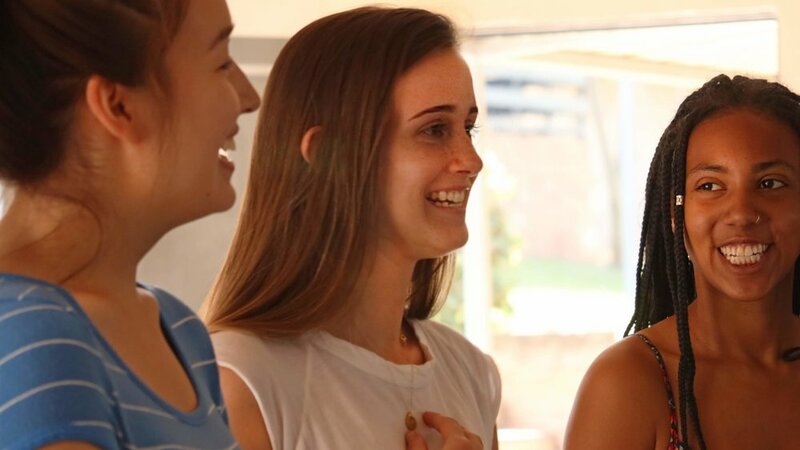 This summer, working alongside PICO-Rwanda, a community-organizing nonprofit, Miller Center deployed six Santa Clara students to conduct “Business 101” and innovation workshops for rural cooperative leaders and urban women micro-entrepreneurs. HCDT was at the heart of the preparation of the students and the content of the workshops. Kelly Grunewald, Miller Center Social Enterprise intern, summed up the power of design thinking: “Human-centered design thinking is a vehicle for transforming the world into a more just and sustainable place.” Kelly experienced firsthand how design thinking guided Rwandan leaders in framing their challenges and discovering solutions “on their own.” She remarked that it helped leaders “tackle big problems,” by making them “more manageable”. The foundation of design thinking is empathy–listening to others and getting to the heart of the challenge. The HCDT method we use at Miller Center is called “The Innovation Journey,” which I developed this year with the help of Shagun Patel, illustrator; Caitlin Blohm, graphic designer; Allan Báez Morales, Director of Frugal Innovation Hub; and countless students, staff, and faculty, who were kind enough to give terrific feedback at all stages of iteration and refinement. A class of engineering, business, and arts and sciences students, learning how to facilitate HCDT, inspired the model. The Innovation Journey focuses on the needs of end users and reminds us that the journey never ends. We now have teams of SCU students using HCDT for field research, Engineers Without Borders projects, student club challenges, and everyday life problems (like how to keep the kitchen clean!). A team even used HCDT to create an innovation space in Nobili Hall for Miller Center for Social Entrepreneurship employees and SCU students. The PICO-Rwanda/Miller Center design-thinking innovation team at Centre Christus in Kigali, Rwanda. Human-centered design thinking transforms people. Instead of being paralyzed or overwhelmed by the complex problems of the world, practitioners are trained to develop solutions while focusing on the spoken and unspoken needs of the end users. HCDT is not a fad–it is here to stay, and it is a new tool in the hands of passionate change makers. There are innumerable examples of people around the world who are following through with HCDT projects that are changing lives. Our Santa Clara students are living proof of how human-centered design thinking is transformative! Note: If you would like to help support the Global Social Benefit Fellowship or Social Enterprise Internship program, please click here or contact David Harrison at dmharrison@scu.edu. These transformative programs are dependent on financial support from generous donors. Michelle Stecker, PhD, Miller Center’s Director of Education and Action Research, teaches and designs social innovation and entrepreneurship curriculum and leads the effort to integrate human-centered design thinking into the College of Arts & Sciences at Santa Clara University. Photo and image credits: Video produced by PICO International; all other images and photos property of Santa Clara University.